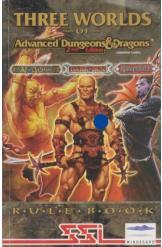 Three Worlds of Advanced Dungeons and Dragons Rule Book Mindscape Game. Book is in good condition, all pages intact. A complete strategy guide for the Al-Qadim, Dark Sun, and Ravenloft Dungeons and Dragons videogames.